Here’s a cool example of a satellite recycling project. NASA used to have a probe called QuikSCAT that took a look at ocean wind speeds — including hurricanes, storms and typhoons. After 10 years of loyal service, the satellite failed in 2009 and a full replacement looked expensive. Now, however, spare parts for QuikSCAT are going to be used on the International Space Station for a low-budget fix (which the agency says will work just fine). The parts are old — they are from the 1990s — but incredibly, they are functional. NASA also added some newer, commercially available hardware to make ISS-RapidScat fit in the space station as well as the SpaceX Dragon spacecraft that will bring it to orbit in early 2014. “If there’s an error or something because of radiation, all we have to do is reset the computer. It’s what we call a managed risk,” stated Howard Eisen, the ISS-RapidScat project manager at NASA’s Jet Propulsion Laboratory. There’s another big difference with this scatterometer mission: it’s flying in a different orbit that most. A typical mission will do a sun-synchronous orbit, making it cross the Earth’s equator at the same local time every time it orbits the planet (say, 12 p.m. local.) The ISS, however, passes over different parts of Earth at different times. “This means the instrument will see different parts of the planet at different times of day, making measurements in the same spot within less than an hour before or after another instrument makes its own observations,” NASA stated. NASA plans to share information with the European MetOp ASCAT scatterometer. Between the two missions, NASA expects that about 90% of Earth’s surface will be examined at least once a day,with some parts visible several times a day. All in all, NASA is presenting the recycling project as a boon at a time when the agency is grappling with its 2014 budget request. Instead of an estimated cost of $400 million to launch a replacement QuikSCAT, the cost of ISS-Rapidscat is expected to reach $26 million. 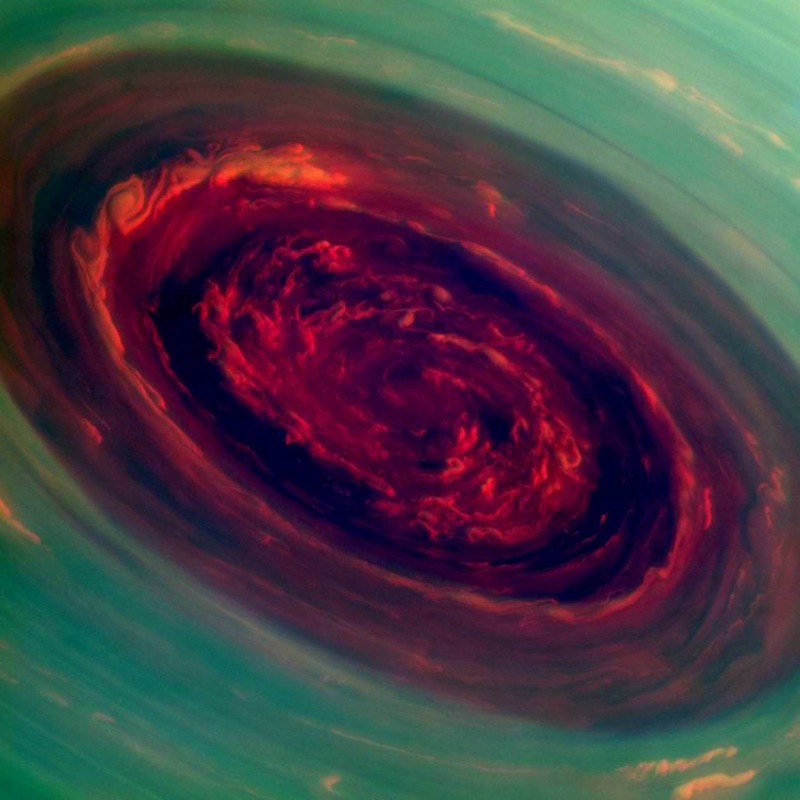 Checking out the above pictures of a Saturn hurricane, one can’t help but wonder: how close was the Cassini spacecraft to spiralling down into gassy nothingness? These dizzying images of a hurricane on Saturn, of course, came as the spacecraft zoomed overhead at a safe distance. NASA’s goal in examining this huge hurricane is to figure out its mechanisms and to compare it to what happens on our home planet. Hurricanes on Earth munch on water vapor to keep spinning. On Saturn, there’s no vast pool of water to draw from, but there’s still enough water vapor in the clouds to help scientists understand more about how hurricanes on Earth begin, and continue. There’s one big change in hurricane activity you’d observe if suddenly shifted from Earth to Saturn: this behemoth — 1,250 miles (2,000 kilometers) wide, about 20 times its Earthly counterparts — spins a heckuva lot faster. In the eye, winds in the wall speed more than four times faster than what you’d find on Earth. The hurricane also sticks around at the north pole. On Earth, hurricanes head north (and eventually dissipate) due to wind forces generated by the planet’s rotation. “The polar hurricane has nowhere else to go, and that’s likely why it’s stuck at the pole,” stated Kunio Sayanagi, a Cassini imaging team associate at Hampton University in Hampton, Va.
Cassini initially spotted the storm in 2004 through its heat-seeking infrared camera, when the north pole was shrouded in darkness during winter. The spacecraft first caught the storm in visible light in 2009, when NASA controllers altered Cassini’s orbit so that it could view the poles. Saturn, of course, is not the only gas giant in the solar system with massive hurricanes. Jupiter’s Great Red Spot has been raging since before humans first spotted it in the 1600s. It appears to be shrinking, and could become circular by 2040. Neptune also has hurricanes that can reach speeds of 1,300 miles (2,100 kilometers) an hour despite its cold nature; it even had a Great Dark Spot spotted during Voyager’s flypast in 1989 that later faded from view. Uranus, which scientists previously believed was quiet, is a pretty stormy place as well. Check out this YouTube video for more details on how Saturn’s storm works. Just released, this mesmerizing animation was created by Kevin Ward from images acquired by NOAA’s GOES-O/14 satellite. It shows the progression of Hurricane Sandy, currently a Category 1 hurricane off the coast of the eastern U.S. that’s poised to make a devastating impact when its heavy rains, winds and storm surges strike the shores of many major metropolitan coastal areas — including New York City and Washington, D.C.
Nearly 12 hours of time are compressed into 30 seconds, revealing the evolution of Sandy as it churned over the Atlantic on Sunday, October 28. This time-lapse animation shows Hurricane Sandy from the vantage point of geostationary orbit—35,800 km (22,300 miles) above the Earth. The animation shows Sandy on October 28, 2012, from 7:15 to 6:26 EDT. Light from the changing angles of the sun highlight the structure of the clouds. The images were collected by NOAA’s GOES-14 satellite. The “super rapid scan” images — one every minute from 7:15 a.m. until 6:30 p.m. EDT — reveal details of the storm’s motion. Launched by NASA as GOES-O on June 27, 2009, GOES-14 is now under control by the NOAA, keeping an eye on the mid-Atlantic region from a geostationary position approximately 22,300 miles (35,800 km) above the Earth. Sandy is expected to bring up to 10 inches of rain into New York, with a surge possible over 6 feet above high tide and wind gusts in excess of 75 mph. Once the hurricane moves inland there could be millions left without electricity. States of emergency have already been declared in many areas within Sandy’s projected path. Currently Sandy is off the coast of North Carolina (at the time of this writing, 34.5 N / 70.5 W) moving northeast at 14 mph (22 km/h) with a low pressure of 950 mb… that’s as low or lower than some of the most powerful storms to hit the eastern U.S. over the past century, including the “perfect storm” of 1991 (a low system which also struck at Halloween) and the deadly 1938 “Great Hurricane”, which devastated coastal regions all across southern New England. Stay up to date on Hurricane Sandy’s progress on the NOAA page here, with the latest public advisories being posted here. The eastern Gulf of Mexico is getting lashed by tropical storm Debby, which whipped up tornado-spawning winds and dumped inches of rain across much of Florida, Mississippi, Alabama and southern Georgia over the weekend. NASA’s Aqua satellite acquired this image on June 23, just after the depression strengthened to full tropical storm status. Born over the warm, moist air of the Gulf off the coast of Mississippi on Saturday afternoon, Debby quickly strengthened to storm status with sustained winds currently reported at over 60 mph. Slow-moving at a 6 mph crawl to the northeast, Debby continues to drench the Gulf state coasts with inches of rain — up to 10 to 20 inches projected for some areas. Major flooding has already become a problem and reports of tornadoes have been coming in since Sunday afternoon. Debby will likely become a hurricane at some point, although her future path is still not entirely known. Launched on May 4, 2002, NASA’s Aqua satellite specializes in keeping track of the movement of water around the planet in all its various forms. Find out more about the Aqua mission here.